Erect to spreading shrub; stems 0.5-2 m tall; young twigs somewhat angled, yellow-green, glabrous or very finely hairy; old bark greyish. Alternate, deciduous, oval to egg-shaped, (1) 2-7 cm long, 1-3 cm wide, entire or inconspicuously toothed, the teeth mostly below midlength, tips usually pointed, bases pointed to blunt, lower surface distinctly lighter, more or less with a bloom, with midnerve sparsely hairy with coarse, stiff, glandular hairs. Solitary in leaf axils, appearing when or after the leaves expand; flower stalks 5-15 mm long, usually at least 10 mm long in fruit, straight or nearly straight, somewhat enlarged immediately below the ovary; corollas bronzy-pink, globe- to urn-shaped, as wide as, or wider than long, widest just above the base, about 7 mm long; calyces obscurely lobed or wavy, lobes deciduous in fruit; styles usually slightly exserted; filaments glabrous, shorter than the anthers; anthers awned, with terminal pores. Berries, globe- to pear-shaped, 7-12 mm wide, bluish-black to purplish-black, without a bloom; good flavour. Some authors (e.g., Vander Kloet 1988) combine V. alaskaense with V. ovalifolium. However, the two species have different though overlapping ranges, and they segregate along several environmental gradients, as data from 4750 study releves indicate (Pojar et al. 1997). The trends are for more V. ovalifolium and less V. alaskaense with increasing elevation, decreasing maritime influence, and on wetter sites. When growing together they can be difficult to differentiate initially. 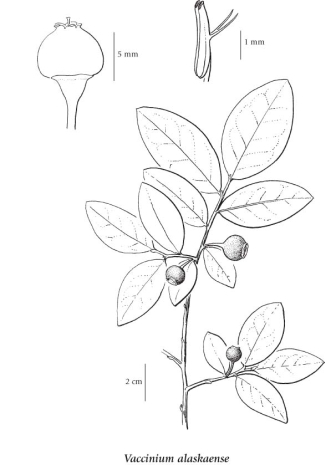 However, with some experience field workers have no problem distinguishing them by a combination of leaf, flower and fruit characters, as in the key and descriptions. Mesic to moist forests and forest openings in the lowland, montane, and subalpine zones; common along the coast of BC, rare E of the Coast-Cascade Mountains; N to S AK and S to NW OR. 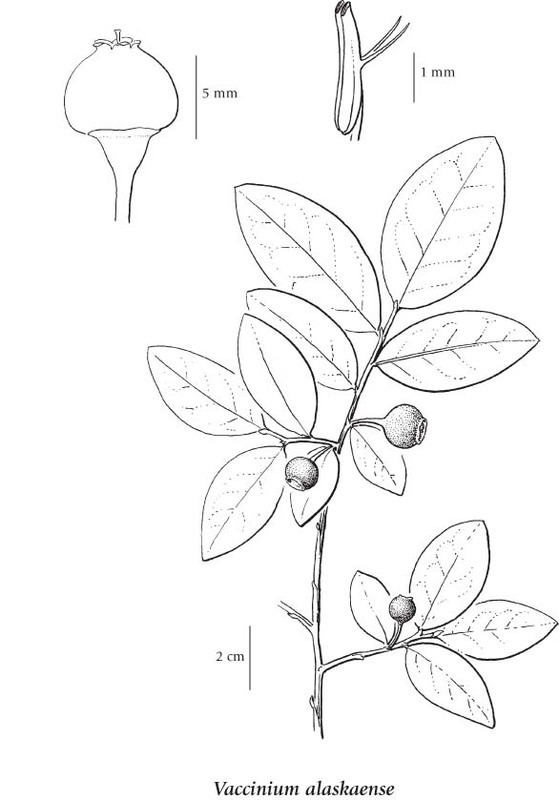 A shade-tolerant, submontane to subalpine, Pacific North American deciduous shrub. Occurs in hypermaritime to maritime subalpine boreal and summer-wet cool mesothermal climates on fresh to very moist, nitrogen­poor soils; its occurrence decreases with increasing precipitation and continentality.